Minimalism is a lifestyle in which you reduce your possessions to the things which you value the most. In recent years, it has seen a huge rise in popularity within many aspects of life including reduced consumerism, increased self-sufficiency, a “less is more” attitude to technology and cloud storage, and even encompassing diets and how one can simplify them. I believe the beauty of minimalism lies in the “why” behind the movement. Best-selling minimalist author, Joshua Becker defines it as such, “(Minimalism) is marked by clarity, purpose, and intentionality. At its core, minimalism is the intentional promotion of the things we most value and the removal of everything that distracts us from it. It is a life that forces intentionality. And as a result, it forces improvements in almost all aspects of your life.” Simply put, minimalism is intentional living. Everything you have should have a specific purpose, and by questioning the purpose of your possessions you begin to understand the value of your belongings. Intentionality. Plato, Aristotle, Marcus Aurelius, Seneca, and countless ancient philosophers spoke highly of living intentionally. They believed in the need to act with purpose in order to be conscious and fully aware of one’s life. If you are constantly questioning the intentions of your actions and words, you begin to have a greater understanding of yourself and why you do things. Through this process, there is a natural improvement in everything you do. So why don’t we talk about intentional actions in coaching more often? Intentionality is the key to positional play. It gives each technical action a purpose. It facilitates communication between players through the use of non-verbal cues in each action. But more importantly, it’s the ‘why’ behind every action. When everyone knows the why, the team plays with understanding and fluidity. Intentionality is simply a byproduct of defining the why. When the why is defined, each action can now be evaluated with the purpose in mind. For example, if a centre back executes a pass to the outside back with the intention of advancing the ball forward, naturally, the pass must be in front of the receiver for the movement to be more fluid. The outside back does not have to receive the ball and then turn to see where they should go next. The centre back’s pass has already communicated the intention by playing the pass in front of the receiver, in the direction of where they should go. If every player acts like this, the team will play with fluidity and efficacy unconsciously. This is the power of intention. Recently, I came across the following video on Twitter which displays LA Galaxy *trying* to play out from the back. As you’ll see the build-up play is a shocking display of awkward passes, aimless runs and purposeless receptions which culminate in the team failing to break any line of pressure and ultimately giving the ball away every time. This series of poor attempts to build out screams lack of intention. Every pass was done to get the ball off their feet, every reception with no idea of what was next, every run without any consideration for the space. I wanted to give LA Galaxy the benefit of the doubt. Perhaps they had had a poor match or even a bad series of passes. It can happen to any team on the worst of days. So I decided to watch more of their games. The following video is the result. When comparing MLS and European teams, one aspect which gets thrown around constantly is speed of play. 'The speed of play in the United States is too slow.’ This term, speed of play, gets thrown around as the reason for poor play but in reality isn’t the speed of play just a consequence? Take a sprinter. When he or she finishes a race in last place, the coach doesn’t just tell the sprinter, ‘run faster.’ The coach would analyse the technique of the runner to diagnose why the runner is running slow. The speed is a consequence of poor execution. LA Galaxy’s build up is exactly the same. To improve this, their intention should be to increase speed of play building out of the back and how they do that should be by propagating correct execution through the six elements stated above. The following video depicts some fantastic examples of some purposeful build outs from the back. Watch the video with the following question in mind; If the team’s intention is to advance the ball from the defensive third through the middle third without giving up possession, then do they execute the following tasks? 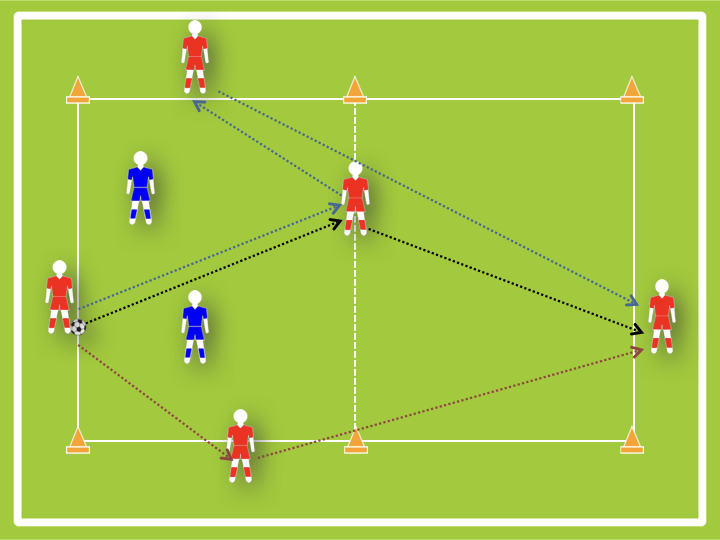 Are all players involved in perceiving the space before receiving the ball? 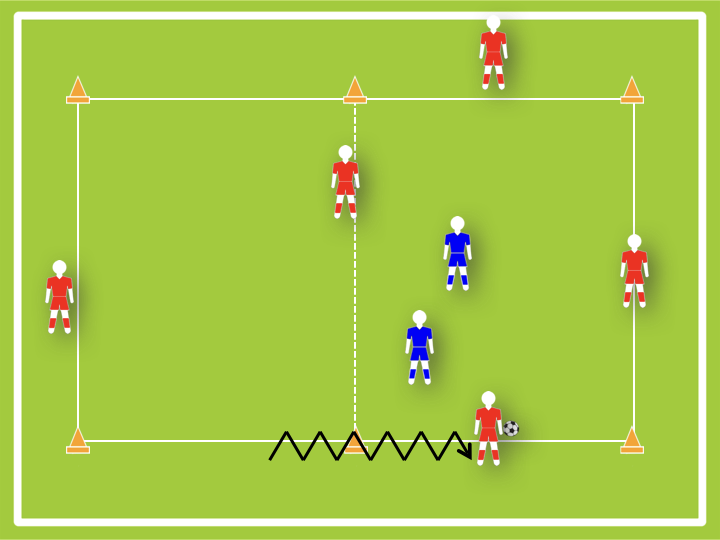 Is each pass correctly paced and placed in relation to defenders and the desired direction? Is each player’s body oriented in order to advance the ball or maintain possession? Is each player positioned to give themselves more space and advance the ball or maintain possession? Now, I want you to go back and watch the videos of the LA Galaxy build up with the previous questions. You should notice a stark difference between the two videos. What we as coaches desire from our players is exactly what we have seen in last video. Each pass is weighted properly to beat defenders into open space and in the direction of said space. Each pass is a ‘blessing not a burden’, as Todd Beane of TOVO Academy says. Good positioning gifts more precious time on the ball and in the correct location. Correct body positioning allows for the seamless transfer of the ball while moving the ball almost effortlessly in the desired direction. Guided receptions avoid the oncoming pressure of the nearest defender to maintain possession as well as advancing the ball towards the final objective. It’s fluid, continuous, purposeful, possession football. It’s more difficult to unlearn than to learn. That’s the blessing we have as youth coaches. We can still train the necessary habits needed to play at the highest level. By transmitting the why to them and placing them in realistic, game-like scenarios, they will be able to develop the competencies and cognition required. More importantly, through this type of training methodology they will be able to develop on their own through a process of continuous perception, execution, and assessment. 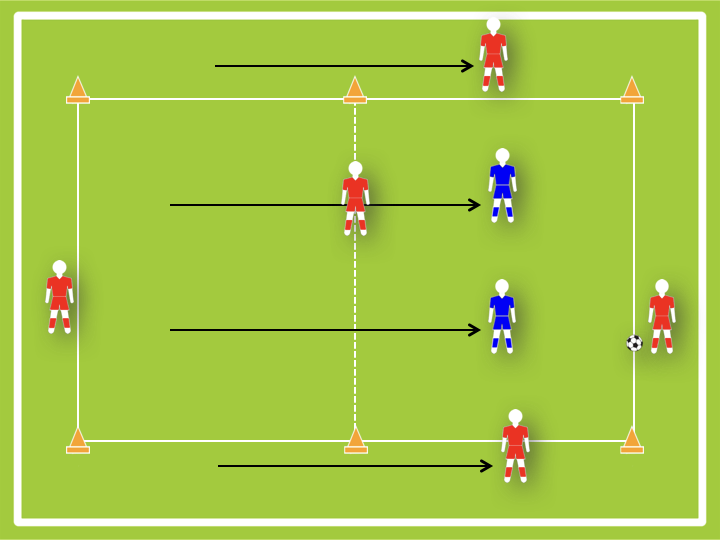 One simple exercise which focuses on progressing the ball is a 4v2+1. The purpose of this exercise is for the 4 players to maintain possession on one side of the rectangle and then, when they are able to, get the ball to the further player who is waiting. Once this occurs, the two offensive players on the wings move and support the player who has received the ball and the two defenders move to the other rectangle to pressure the ball. There is now a new 4v2 in this new rectangle. The beauty of this exercise is that with the correct restrictions, it can be used for all ages. For example, for high level teams you can set the restriction that in order to switch the ball to the waiting player they must pass to the middle player who has to pass to a different player who will make the transitional pass. This stipulation promotes the third man concept. For younger ages, what we are trying to instil is to perceive where the pressure is coming from and where they want to take the ball after receiving it, in this case the final objective is getting the ball to the other side of the rectangle (free space). We can simplify the game by allowing them to dribble into the other grid. During the game play we can remind them that if they want to get there before the defender, they can receive the ball in the direction of the open space. In the long run, we want them to naturally take the ball to space with a purpose. Throughout their lives they will see different scenarios but this situation will occur over and over again, and that’s why it should be deeply engrained into their play. It’s highly important to make sure the objective, or the why, is always clear and developmentally appropriate. When they know why they are doing something, they take more interest in the activity and can begin to create their own mental models of the scenarios created. Additionally, there must always be clear coaching points to be communicated to the player. In these exercises, the two key components are passing with the direction in mind and receiving with intention. When all of the players within the rondo are able to perceive and execute flawlessly, we will finally achieve continuity and fluidity in their play thus increasing their speed of play. For the past year I have been working with Todd Beane of TOVO Academy. Among many of the intellectual approaches he makes towards the coaching profession, I believe the most impactful one is his passion for the why. In the many training sessions we developed, what we always started with was the intention. What are we trying to achieve? When is this applied in matches? From there we would create training scenarios with the situation we wanted to bring forth. During the training session, every coaching point which we made to the players always had in mind the original objective. The emphasis was always on the players’ intentions. We are trying to find our winger, is that touch working to achieve that? We want to draw out the opposition, did that dribble in that direction succeed to do so? What was your intention with that action? In my humble opinion, intentionally is the only way to live. One of the most famous Stoics, Marcus Aurelius said, “Our words and actions should not be like those of sleepers or of children copying their parents, doing and saying only what we have been told.” If we do not question the intentions of our actions, we walk through life as naive sleepers only doing what everyone else has always done. Questioning one’s intentions is by definition being a critical thinker. It lifts the blindness that society’s norms bestow and allows you to see the world with new eyes. It spawns creativity, originality, and inspiration and isn’t that what we want from our players? If you are interested in the training sessions described in the article or in our new video consultancy service, you can find everything in the Training Guide section as well as a 'Free Sample'.